It was Presidents' Day, or Washington's Birthday, or whatever we are supposed to be calling it these days. And that means no school! It was also only about 30 degrees out, so the two of us took advantage of the opportunity to warm up with a fantastic lunch of Korean food at Goong Asian Restaurant in East Hartford, CT. It is easy to drive by and miss it, as it is (somewhat depressingly) located in a mostly abandoned strip mall on Silver Lane. However, there are plenty of upsides to that: it is located just minutes off I-84; there is ample free parking; there is an Asian market nearby in case you want to recreate a dish or two; and, most importantly, there is no other authentic, Korean-specific restaurant in the Greater Hartford area. And did we mention, it's fantastic. Truly good food, and plenty of it. Two cordial and attentive servers shared the task of waiting on the whole floor, about eight tables (not including the private dining rooms), most of which were occupied during our time there. The table was neatly set (Amy loved the long spoons with the fancy covers!) 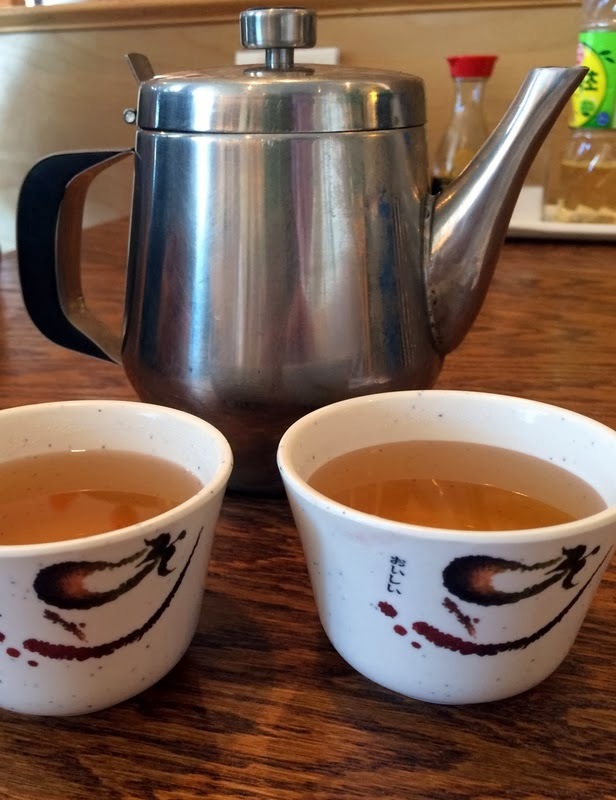 and we were immediately given a teapot filled with a steaming, light brown brew that had beautiful notes of toasted rice. The cups were a welcome handful for two winter-weary people such as ourselves. We were pretty hungry and ordered a large plate of steamed pork and beef dumplings (Mool Mandoo) to start. Before they arrived, we were served our complimentary kimchi, or traditional variety of pickled and marinated vegetables. Ours included (clockwise, starting at top left): black beans, cucumbers, bean sprouts, lettuce, cabbage,and potatoes, as well as a bowl of miso soup for each of us. Then our dumplings arrived, presented on a plate lined with a ladle-full of the steam water and accompanied by a side of dipping sauce. 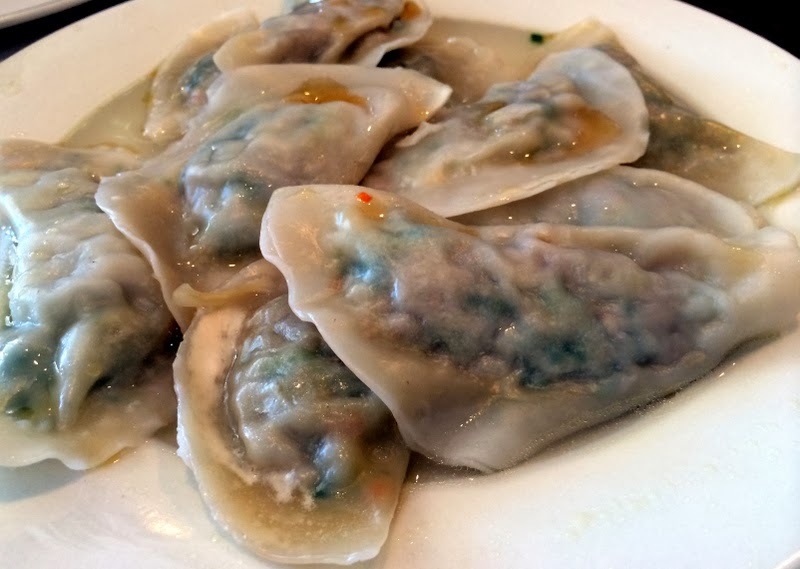 The dumplings were large, perfectly steamed, and very much filled with a wonderful mingling of meat, garlic, ginger and scallions. And they were gone in minutes. The dumplings and the kimchi alone could have sufficed for lunch, but we soldiered on, wanting to taste more of what Goong had to offer. 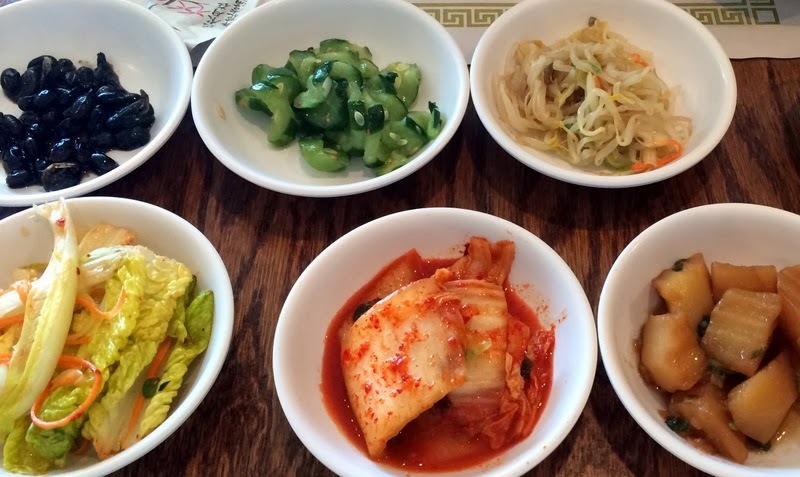 We stuck with the more well-known, traditional Korean dishes, ordering from the lunch special menu which offered items at a lower price but seemed to be lacking nothing else. 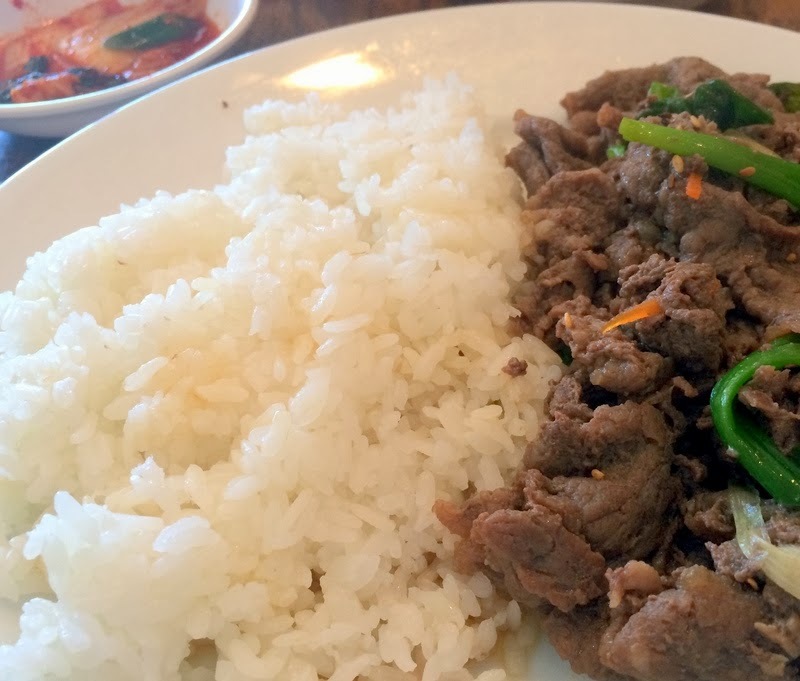 Amy got the BulGoGhi Dup-Bab, sweetly marinated strips of Korean barbecued beef served with steamed rice. Although she wished for more of a char on the meat, the tenderloin strips were exceptionally tender and the flavor was outstanding. We're sure she'll be ordering that again. Chris wanted to see if our own version of Bibimbap was as good as we thought it was and ordered Goong's DolSoht version. It arrived in a sizzling stone hot pot filled to the brim with beef, vegetables, and rice, all seasoned with hot pepper paste and topped with a sunny-side up egg. Ours was good, but now that we've discovered Goong, we probably won't be making it again any time soon (if ever!). The hot pot crisped the rice nicely, creating a wonderful textural balance to the creamy egg yolk, cooked veggies and spicy beef. Talk about comfort food - hearty, soulful and so very satisfying. As we finished, the server brought us orange slices and to-go boxes and we were happy to get to nosh on the dishes later on that evening. 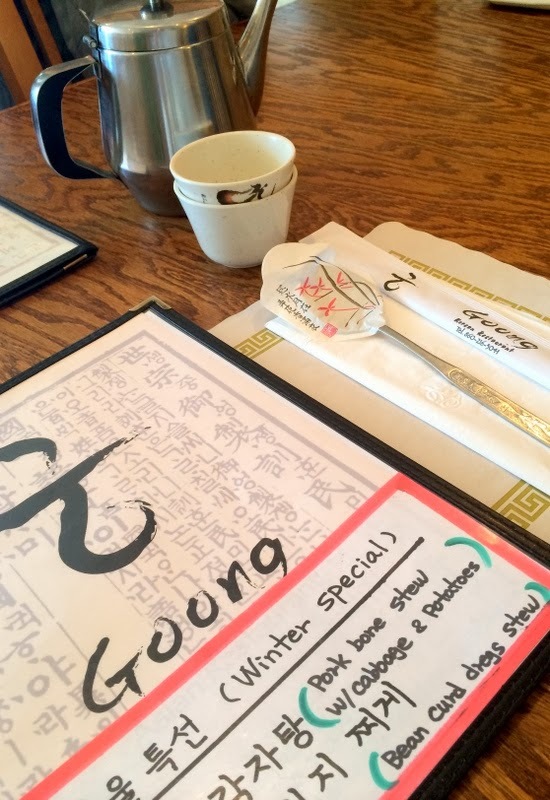 We were also so happy to have finally visited Goong, which has been on our to-do list for a while. It was worth the wait but we won't wait long until next time. 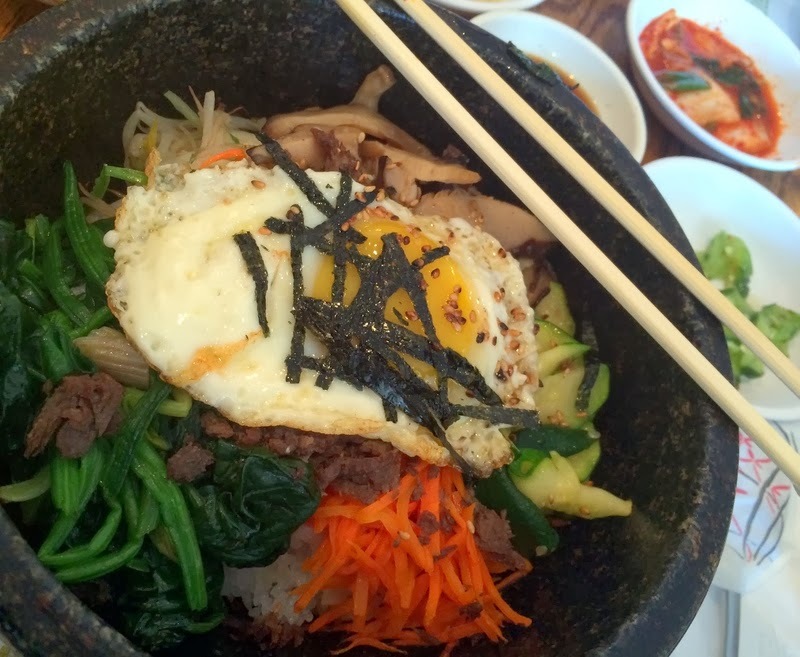 Goong is located at 798 Silver Lane in East Hartford, is open for lunch and dinner every day except Tuesday. Looks like a great restaurant.